Changing the World, One Wall at a Time tells the story of Education Is Not A Crime – one of the world’s largest street art and human rights campaign to raise awareness of education discrimination by Iran’s government against tens of thousands of young Baha’is. This film was produced by Iranian-Canadian journalist Maziar Bahari as part of the worldwide Education Is Not A Crime campaign. The Bahá’is, who believe in ideals such as the equality of men and women, peaceful non-violence, and universal education, have been persecuted by the Iranian government since the 1979 Islamic Revolution. As part of this persecution, the government bars Bahá’is from teaching and studying at Iranian universities. Education Is Not A Crime raises awareness of this discrimination. The campaign began in 2014 with Bahari’s documentary film To Light A Candle, which was screened in nearly 300 locations around the world, before expanding into a global street art project raising awareness about the Bahá’is. Forty-one murals have been painted in US and international cities as part of the project: Atlanta, Cape Town, Delhi, London, Nashville, Sao Paulo, Sydney, with two-dozen in New York City. Nineteen of the New York murals were painted in the iconic Harlem neighborhood because of its long association with cultural innovation during the Harlem Renaissance and the 1960s Civil Rights movement. 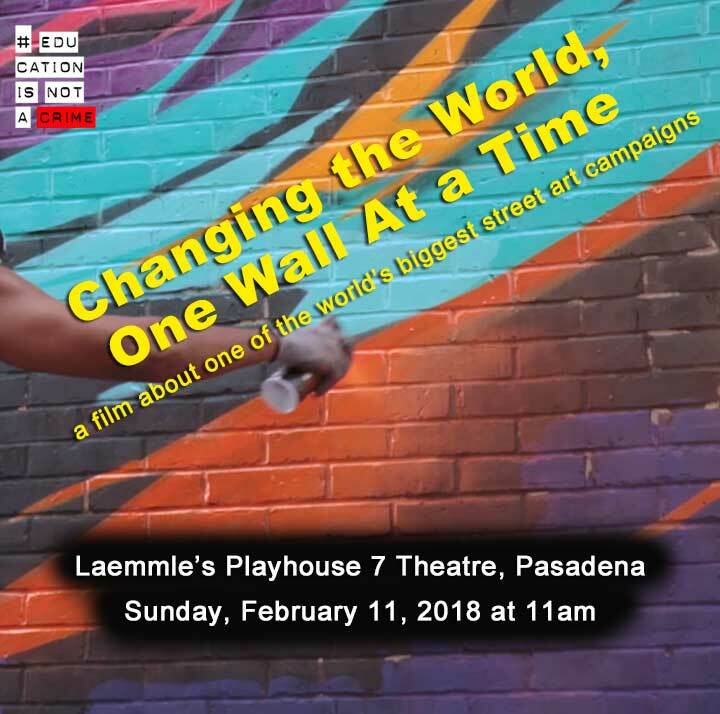 The film features interviews with popular street artists from around the world – as well as activists with experience of the Civil Rights movement, the anti-Apartheid struggle in South Africa, and human rights work on behalf of Iranians of all backgrounds. Iranian Baha’is with personal experience of being denied their right to higher education also share their stories. The mural itself was painted by seven students and Eliot Arts dance instructor and muralist Amber Plummer. Depicted is the Earth encompassed in a pair of hands with a large tree in the center surrounded by silhouettes of Eliot Arts’ students engaged in reading with a quote by Nelson Mandela under the mural, “Education is the most powerful weapon which you can use to change the world”. The mural is a 450 square feet and located on the landing of a staircase at the northwest corner of the school.